WARSAW/JERUSALEM (Reuters) - Poland pulled out of a planned summit in Israel after Israel's acting foreign minister said on Monday that "many Poles" had collaborated with the Nazis in World War Two and shared responsibility for the Holocaust. Polish Prime Minister Mateusz Morawiecki branded the remarks "racist and unacceptable". He had previously said he would not join Tuesday's gathering of central European leaders in Israel, sending instead a lower-level delegation, but said on Monday that no Polish officials would now attend. "Not only can we not accept such racist comments, but with all our strength we want to stress that we will fight for historical truth, for the honor of Poles," he told reporters. The leaders of the other three 'Visegrad Group' nations - Hungary, the Czech Republic and Slovakia - all still planned to attend the talks, Israel said, but Czech Prime Minister Andrej Babis said they would instead consist of bilateral discussions and that the summit would be rescheduled for later in 2019. Poland's right-wing Law and Justice (PiS) government has made what it sees as the defense of national honor over its wartime record a cornerstone of foreign policy since taking power in 2015. Many Poles refuse to accept research showing thousands of their countrymen participated in the Holocaust in addition to thousands of others who risked their lives to help the Jews. They say Warsaw's Western allies have also failed to acknowledge the scale of Poland's own suffering under wartime occupation. Israel's Acting Foreign Minister Israel Katz exacerbated the dispute on Monday when he told Israel's Army Radio: "Many Poles collaborated with the Nazis and took part in the destruction of the Jews during the Holocaust." Katz also quoted comments attributed to Israel's late prime minister Yitzhak Shamir: "Shamir said that every Pole suckled anti-Semitism with his mother's milk. Nobody will tell us how to express our stance and how to honor the dead." The Polish decision is a blow for Netanyahu, who had hoped the Visegrad summit would burnish his diplomatic credentials ahead of Israel's April 9 election. He sees the Visegrad-4 as a counterbalance to western European countries, which tend to be more critical of Israel's policies toward the Palestinians. "There will be no full V4 meeting. Three PMs are arriving will hold meetings with (Israel's) PM," Emmanuel Nahshon, spokesman for Israel's Foreign Ministry, said in a text message. The dispute also harms Poland's ambitions to lead the V4 and give the region a bigger international voice, though many PiS voters will welcome Morawiecki's decision. PiS leads opinion polls ahead of a national election due in the autumn. 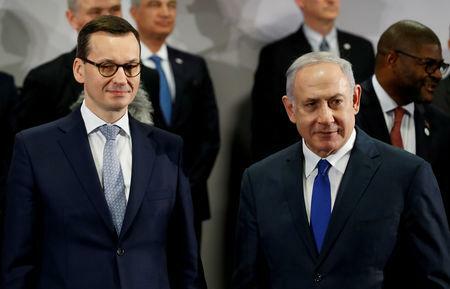 "Morawiecki had to call off the summit after the affront from Netanyahu because otherwise he would appear too soft," said Piotr Buras, head of the Warsaw office of the think-tank ECFR. Before World War Two Poland was home to one of the world's biggest Jewish communities but it was almost entirely wiped out by the Nazis who set up camps such as Auschwitz on Polish soil.